The ever successful company Webasto, who is the world’s leading seller in engine-off vehicle heating equipment, released their SmarTemp Digital Bunk Thermostat early of last year. This revolutionary thermostat was designed to deliver the most accurate temperature controlling ever in tractor trailer vehicles. This handy device helps save fuel, lower the amount of emissions that is produced, and helps reduce certain maintenance costs over time. 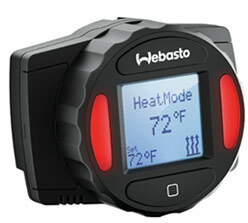 One of the greatest aspects of the Webasto SmarTemp is that it’s small in size and super simple to operate. Drivers have the ability to set the temperature that they want in their cab and this handy device does all of the work. The dial turns from left to right for warmer or cooler temperatures, it certainly doesn’t get any easier than that. Once the driver sets it at the temperature that they want, the bunk stays at this temperature ensuring that the driver is able to focus on rest instead of having to fiddle with the thermostat the entire time. The thermostat has a relatively large and backlit LCD screen that makes it super easy to read and continuously shows the current temperature in the bunk and also the temperature that it is set on. The screen itself will brighten when you begin interacting with it and will dim after a certain amount of time with no interaction. Simplicity is the key to this amazing device; users will easily be able to operate it. With one push of a button you are in the menu with a list of options. Users use the dial to go through the options and select which one they want. Located on the main menu you can choose heat or ventilation mode and choose between different languages, Fahrenheit, or Celsius. Users can also set a timer for the thermostat to shut off at a certain time or run continuously. You will have password protection and it even displays tips on preventive maintenance options. The panels change colors depending on different modes. Red is for heating mode, blue is for ventilation mode, and a blinking shows a diagnostic alert. “Designing a controller that is both easy and precise is just part of the ROI equation,” Hickey said. “Operator satisfaction, comfort and safety are paramount in today’s environment, as are the more traditional metrics of fuel consumption, emission compliance, battery life and maintenance costs. Webasto’s SmarTemp thermostat is a must for all drivers to help make life simpler and more relaxing when you need to rest.